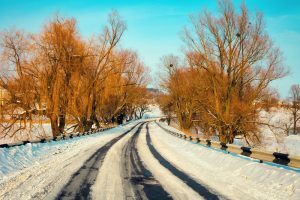 Providing snow plowing services for residential and commercial and customers in Raleigh and the surrounding areas alike, we can ensure that your parking lots or driveway are completely snow-free. Left to accumulate, snow can make your drive completely impassible, slippery, and unsafe for days, so don’t just leave the snow alone and hope it melts! Get a snow plowing service you can count on when you call Unlimited Professional Services. You’ll be so glad you called us when you don’t have to pick up a shovel or worry about the safety of your customers or employees. Our main focus when it comes to snow plowing is more on the commercial side, such as an apartment building parking lot or the entirety of the outside of your business. A lot of people put down salt or other pre-treatments and expect that to completely eliminate any snow that falls. 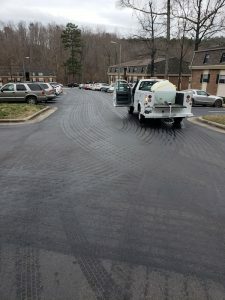 While treating is always better than not, the only way to truly be sure that your parking lot or walkways are totally clear is to call in the pros. Don’t hesitate to give us a call so we can talk about what you need done, chances are good that we can help you out somehow! You can also rest assured that you don’t have to worry about us causing any damage to your surfaces. We go out of our way to make certain we’re plowing in the right area, as pros at putting down driveways and such ourselves, we know what to look out for. Don’t settle for some cheap service who might do half of the job or cost you more in repairs, go for the true professionals. So don’t spend hours out in the cold, barely making a dent in whatever you may be shoveling. Stay warm and watch from inside while we get you all taken care of. Contact us today to arrange your snow plow service for this winter. We are proud to be able to offer our services in Raleigh, Durham, Cary, Apex, Garner, Clayton, and many more areas! If you’re in need of services, just call us up and we’ll work it all out, we should be able to cover the large majority of people that contact us! Don’t let some snow be the only thing keeping you from making money. Salt brine is an effective liquid solution for fighting snow and ice on roadways. It can be used as pre-treatment, an anti-icing tool, as well as a reactive de-icing technique. While granular salt alone lowers the freezing temperature of ice, it has to be wet for the chemical reaction to take place and melting to start. Putting dry salt down means you have to wait for preempting to begin – in very cold weather this could take days to even begin happening. Brine jump starts the process. You should never be in doubt when it comes to the safety of your customers and employees, with our brine services, you don’t have to be. What Is Brine? Why Pretreat? Brine is a mix of rock salt (sodium chloride) and magnesium chloride, dissolved in water so they can be sprayed on the road. Pretreating prevents ice and snow from bonding to pavement. This Initially improves safety by helping to prevent the formation of hazardous ice on roadways or parking lots. 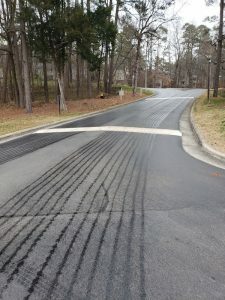 It additionally makes the removal of snow more effective later by preventing the snowfall from bonding as ice or ice-like snowpack to the pavement. Being liquid when applied eliminates the need to wait for natural melting. 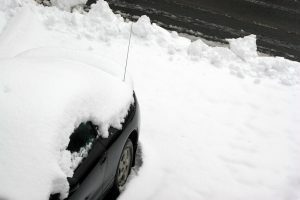 Your road and/or parking lot will be safer for your employees and clients alike to navigate, sooner than any other means of snow and ice removal. We are proud to be able to offer our services in Raleigh, Durham, Cary, Apex, Garner, Clayton, and many more areas! If you’re in need of snow services, just call us up and we’ll work it all out, we should be able to cover the large majority of people that contact us! Don’t let some snow be the only thing keeping you from making money.